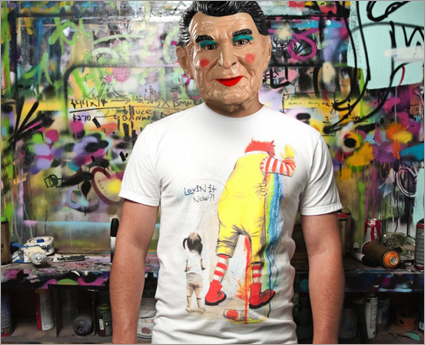 - Threadless is out with a new t-shirt which puts a twist on "I'm Lovin' It" along with a graphic of Ronald barfing up his lunch. - Apparently babies who sleep on mattresses in Milwaukee can die. Who knew? - Yawn. Another flash mob. Oh wait, not yawn! This one's got bikinis. - Cascadian Farms says it's the first-ever branded crop in Farmville. Starting July 19th through July 26th, Cascadian Farm will offer users the chance to purchase organic blueberries for their farms and will provide a variety of other benefits, including coupon offers and organic and green living tips that players can use offline. - Fashion brand Band Of Outsiders the new Spider-Man, Andrew Garfield in its new ad campaign. 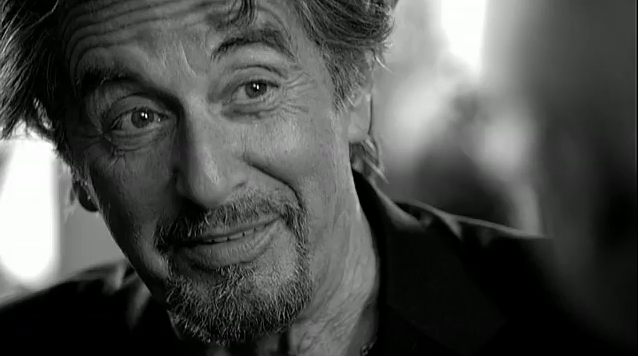 Shot by Barry Levison in New York, this Vittoria Coffee commercial has Al Pacino talking about the importance of coffee in his daily routine. It's airing in Australia. Having just rewatched the Godfather two nights ago, it's amazing to see this man still going after all these years. Dog Day Afternoon. Scarface. Serpico. Carlito's Way. So why not pimp a little coffee after all these years? Joining Kellan Lutz and Eva Mendes, Avatar actress Zoe Saldana will model Calvin Klein Envy line of underwear in a new ad campaign. The campaign will include print, outdoor and digital. Of the line which aims to create "a more revealing silhouette," Saldana said, "Calvin Klein has always put forth such beautifully executed campaigns. It's very exciting for me to be associated with such an iconic, globally recognized brand like Calvin Klein Underwear." Yea. We know. There's really no redeeming quality nor reason to mention this new campaign featuring the Kardasian sister's pimping their new Beach Bunny swimwear line except for the fact it's summer and it's hot and they're hot. Well, that's a matter of opinion but they're wearing bathing suits and, well, it's summer so, yea, that justifies this. When you write about advertising every day, suffering de ja vu every once in a while comes with the job. Today, Julia Stiles is the cause of our ailment. She's in a new Stoli commercial in which she talks to herself and debates the merits of going commercial versus staying indi. Though the ad is new, we could swear we've seen it before. Maybe it's because we couldn't stand watching Hugh Hefner talk to himself and we conjured Julia instead.Anyway, anytime we can see Julia Stiles is a good time so we're not going to complain. Yesterday, in a Digitas-run session called "Cage Fighting Comes to Cannes," Common explained what his brand is and how he gauges the value of sponsorship opps. How do you get a respected artist to plug your product? The secret is profound and earth shattering.